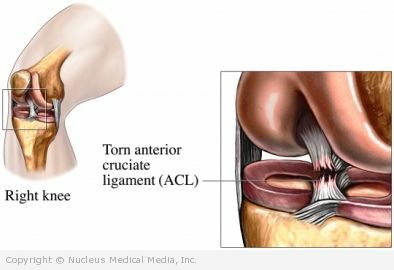 An anterior cruciate ligament (ACL) injury is a tear in the ACL ligament. The ACL is located in the middle of the knee joint and connects the lower leg bone to the thigh bone. It stabilizes the knee by preventing the thigh bone from sliding too far forward at the knee. The ACL can also be injured from a direct blow to the knee. When the ACL tears, you may hear a popping sound. As you stand, the knee will probably give-way immediately, and it will be difficult to walk on the affected leg. There is usually moderate pain and swelling of the knee joint, although in the first several hours, this may be minor. It will, however, worsen over the first two days, and then begin to subside. The doctor will ask about your symptoms and how you injured your knee. A physical exam will be performed. You may need to wear a knee brace while recovering from your knee injury. The brace may also be needed when you return to your sport. This may be needed whether or not you have surgery to reconstruct the ligament. Surgery may be needed to fully restore function of the knee. The decision to have surgery should be made after discussion with your doctor about your athletic needs, age, and associated factors. Range of motion exercises — The therapist will assist you with moving your knee through its full range of motion. Stretching is a part of this treatment. Strengthening exercises — Due to its lack of use, the affected leg muscles will atrophy (shrink) and lose strength. Therapy will help you regain strength in the thigh muscles, especially the quadriceps and hamstrings. ACL tears are often due to noncontact injuries. Precautions can be taken to prevent them. Plyometrics, a form of jumping exercises, can be used to train and strengthen the leg muscles for jumping and landing.